Welcome to our training toolbox page. On this page, we provide our recommendations for golf training aids that we believe are worth the money to purchase and the time to use. We recommend these based on extensive research, feedback from members and other golfers, and experience using them. If you are like most golfers, you want to lower your scores and avoid wasting money. To help you achieve both of these, we invest a sizable portion of our time researching training tools that deliver what they promise for at a reasonable price. This page represents our list of the top training aids – the ones we would recommend based on our research, experience, and potential bang for the buck. These are our favorite training aids for cutting strokes off your golf scores and helping you better enjoy your golf experience. Be sure to check back often for updates and let us know what your experience is like with these tools or others that you would recommend! Please note: The links on this page may earn affiliate income for TheLinksCard.com. You can read our full disclosure here. To get more out of your drivers, hybrids and irons, we recommend picking up a Golf Swing Trainer. These are great for training to improve your swing and for warming up as you wait for you tee time. Golf Swing Trainers help improve swing tempo, strength, and flexibility. The top players in this market apply flex designs in the shaft to help you lengthen your swing by keep your hands and arms extended. This creates power to help gain more distance on your drives. The flex designs also encourage a slight lag at the top of your back swing to help you establish a proper swing tempo. Most also include a weighted head to help you with proper weight transfer and a full follow through for form, balance, and power. While there are many options, we recommend the SKLZ Gold Flex Golf Trainer, which comes in 2 different lengths (48-inch for golfers over the height of 5’4″ and the 40-inch for golfers under 5’4”). 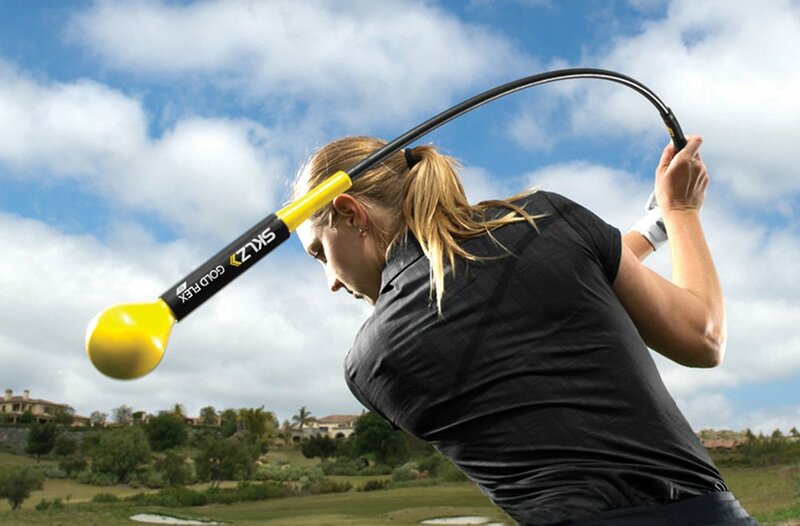 At about $40 less than the 10,000 lb gorilla in the field, the Orange Whip, the SKLZ Gold Flex Golf Trainer provides the same training function at a much greater value. If you want to drop strokes, improving your putting will most likely give you the best bang for your buck. And the only way to improve your putting is: practice, practice, practice. To this end, we have 2 great recommendations for you. 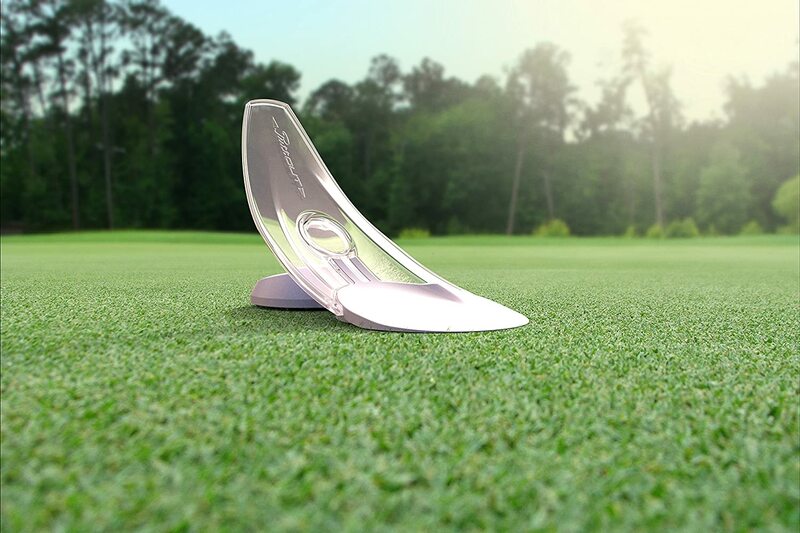 The makers of the PuttOut Pressure Putt Trainer will tell you that the key to great putting is practice. This trainer is styled with white disc at the base of the ramp replicating the size of a regulation golf hole. Anything that rolls over the disc and up the ramp and returns back to the player is a made putt. 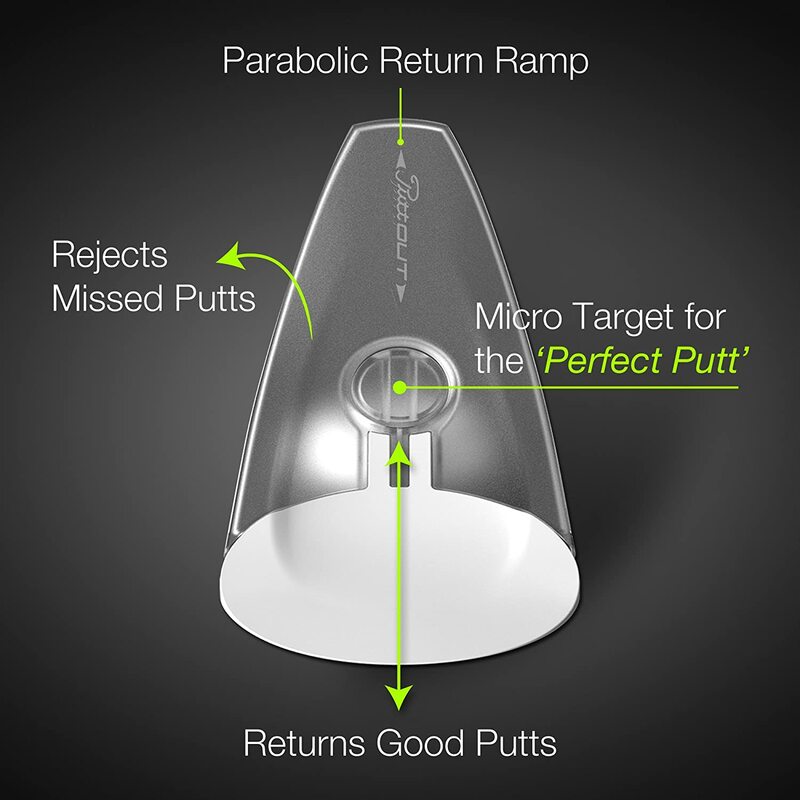 The return feature saves you the trouble of chasing down you putts, or bend over to pluck your ball out of the hole, saving your back and allowing you to focus on repetition. The PuttOut also includes an option plug that can be removed to test your skills or challenge your friends to make the perfect putt. 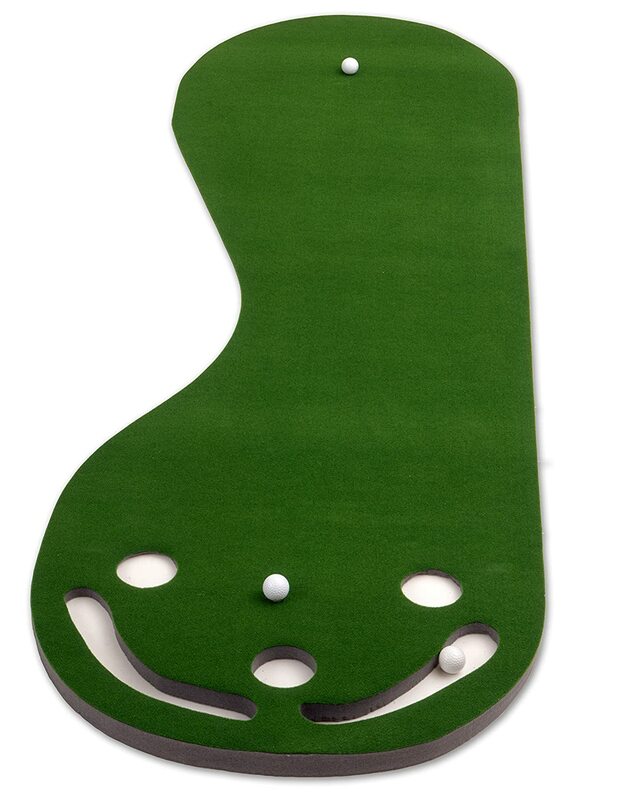 From the many options, we recommend the Putt-A-Bout Grassroots Par Three Putting Green. It is easy to roll up and store and yet the high-quality materials stay smooth when rolled out. We also love the built-in sand trap cutouts that catch missed shots, so that you don’t have to chase down golf balls.